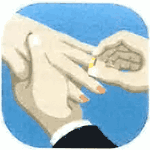 The sacrament of MARRIAGE signifies the union and love that exist between Christ and the Church. It is a faithful covenant in which a man and a woman unite in such a way that, by forming "one flesh," they can transmit human life. As spouses and parents, men and women cooperate in a unique way in the Creator's work. Please call Marge Dixon, our Parish Secretary, at the Parish Office at (708) 449-8430 ext # 10 for information.